New York, N.Y. (April 4, 2017) ­­– HD Expo 2017, the premier show to experience and celebrate hospitality design, will welcome Steve Wynn, chairman and CEO of Wynn Resorts, and his longstanding executive vice president of design Roger Thomas as its keynote speakers. The legendary hospitality duo will take the HD Expo stage at Mandalay Bay on Thursday, May 4th at 12:30 p.m., in conversation with Michael Adams, editorial director of Hospitality Design magazine. In a candid chat, Wynn and Thomas will discuss their latest and greatest, the Wynn Palace Cotai in Macau, a $4.2 billion opulent masterpiece, as well as future development projects, the secrets of their success to a four-decades-long professional relationship, and the early days of building the Las Vegas Strip. Wynn and Thomas have developed and designed some of the world’s most renowned hotels including the Mirage, Bellagio, and Encore and Wynn Las Vegas, to name a few. They have helped redefine Las Vegas by bringing the highest standards of luxury, beauty, and service to their hotels. 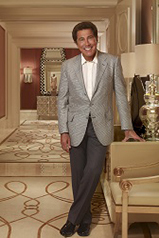 Steve Wynn has been leading casino and resort development in Las Vegas and beyond for more than 45 years. Steve Wynn has long been at the forefront of the industry, serving as the father of the “mega resort” era and continually raising the standards for the casino resort industry in Nevada and beyond. Today, as chairman and chief executive officer of Wynn Resorts and the companies under its corporate umbrella, he has continued to work to expand the frontiers of the industry. Roger Thomas is executive vice president design for Wynn Design and Development. He has created the interiors of Wynn Resorts worldwide including the new opulent Wynn Palace Cotai in Macau. 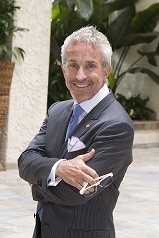 Thomas was elected to the Hospitality Design magazine’s Platinum Circle in 2005 and was named “Designer of the Year” at the International Hotel/Motel & Restaurant Show® in New York and is a five-time member of Architectural Digest’s A.D. 100 and, in 2015, was installed in the Interior Design Hall of Fame. HD Expo attracts the worlds’ most talented and sought after network of interior designers, architects, hoteliers, owners, operators, developers and purchasers: true leaders, creative risk-takers and innovators who make an impact in the industry. Thousands of show attendees will come face-to-face with the most captivating products and resources to consider for their global hospitality projects; stay on top of industry news and trends through daily thought-provoking conference programming; and have access to network and rub shoulders with some of the most prominent players in the industry at a series of networking events. The Hospitality Design Group, part of Emerald Expositions, produces the most influential hospitality design event each year, HD Expo, which takes place from May 3-5, 2017 in Las Vegas. HD Expo is in association with American Society of Interior Designers (ASID); International Interior Design Association (IIDA); International Society of Hospitality Purchasers (ISHP); and NEWH, Inc.—The Hospitality Industry Network. 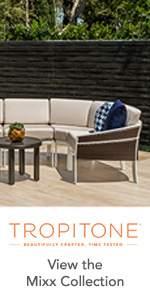 For more information, visit www.hdexpo.com or www.hospitalitydesign.com. Published 11 times a year, Hospitality Design magazine is the premier trade outlet and voice for the hospitality design industry. It serves owners, operators, brands, purchasing agents, interior designers, and architects involved in the design of hotels, resorts, restaurants, nightlife, spas, and all other hospitality-oriented projects. Hospitality Design magazine continues its 36-plus-year mission to connect and enrich the industry through innovative projects, inspiring products, the latest trends, development spotlights, and interesting interviews with some of the industry’s leading and up and coming professionals. For more information, visit www.hospitalitydesign.com.